"..true transparency has been achieved by the PRX150"
" ï¿½ it is FREAKIN' AMAZING!!!" "It is the attenuator that I've been waiting for"
"I'm really lovin the PXR150-Pro!" "..this the ULTIMATE attenuator to my ears." "The PRX150-Pro was accurately able to portray the subtle nuances of my cranked up '68 Marshall Super Tremolo"
"The PRX150-Pro has set the bar for transparency much higher than the competition can reach." "This device is nothing short of amazing!" "..your PRX150-Pro attenuator has put me in "sonic nirvana." 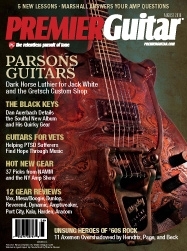 "..it is in a whole different league, excellent product.."
"..it preserves the amp's tone flawlessly .. I feel reconnected to my amp again.."
"When the next big attenuator shootout happens the PRX150-Pro will be the one to blow smoke off its barrel"
"The tone is amazingly true and consistent regardless of the setting"
"The PRX150-Pro is a winner ..."
"the PRX150 is TOTALLY transparent!" "..really is transparent, and works EXACTLY as advertised down to bedroom levels"
"... even at full attenuation, the sound is incredible...very transparent." "The attenuator sounded so good I forgot i was playing thru one." "Iï¿½ve worked hard to get my tone, and the PRX150-Pro ensures that I maintain it at ANY volume." "a "must have" tool for any guitar player"
"...total lack of "fizz" at all volumes." "..its transparency and ability to maintain dynamics is unlike anything else I have tried." "Using the PRX150-Pro every time I play now, it is quickly becoming indispensable for me." "The build quality is perfect, the layout and design is simple and functional.."
"Thank you so much for your fine devotion and workmanship." "The PRX150 maintains my amp's MOJO!" "This thing is great! Totally transparent, versatile..."
"I really appreciate the build quality of your products. Top notch!" "The transparency is just incredible. Your product wins hands down!!!!!!!!! " "Makes the Black Face Super Reverb and Heritage Colonial sing like Pavoratti"
"..it's really transparent, you don't feel there's anything between the amp and the speakers." The PRX150 Line of Power Attenuators, utilizes ARACOM's innovative, patent pending "Speaker Reactance Thru" Technology to provide highly transparent power attenuation. 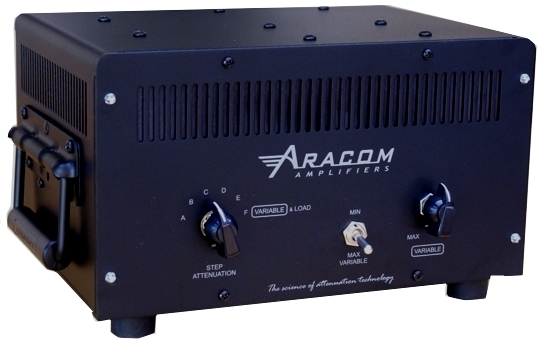 ARACOM Amplifiers offers two power attenuator solutions, the PRX150-Pro2 and the PRX150-DAG. There are hundreds of satisfied PRX150 attenuator customers and the product is used by guitarist in more than 25 countries. The PRX150-Pro2 is a power attenuator designed to be used with tube amplifiers and it allows guitarist to achieve the much desired "fully cranked up" tone from their tube amp, but at more practical volume levels. Utilizing its unique and innovative "Speaker Reactance Thru" (SRT) technology, the PRX150-Pro2 allows the speaker to fully maintain its natural reactance. As a result, the PRX150-Pro2 allows the amplifier's original, "cranked up" tone to be maintained at reduced volume levels. The PRX150-Pro2 can be a valuable tool for any guitarist. During practice time, when recording, or when rehearsing with the band; you can enjoy the cranked-up power tube tone of your amplifier "the way it was meant to be heard", but at lower volume levels, while pleasing your ears and at the same time not upsetting the neighbors. When playing live you can turn up your tube amp until the cherished power driven tone is reached, then "click" down a notch or two via the Power Rox Attenuator to please your sound man. Everyone will be happy with your tone, most importantly your audience. The PRX150-Pro2 is a "boutique" product that is handcrafted in the USA. Each PRX150-Pro2 power attenuator is carefully, handwired, one at time by craftsmen that are concerned more about quality rather than quantity. The PRX150-Pro2 utilizes high end components, including those that are customized specifically for the Power Rox's advanced attenuation technology. The PRX150-Pro2 is designed to be "Road Ready" with its heavy duty, ventilated, aluminum enclosure. The key to the PRX150-Pro2's natural sounding attenuated tone, lies within its patent pending SRT technology. Unlike the competition which alters, significantly reduces or completely isolates the speaker's reactance, the PRX150-Pro2's step attenuation has NO impact on the speaker's reactance, allowing the speaker to respond naturally to the tube amplifier's complex signal. Since the SRT technology allows your speaker's reactance to remain intact, the PRX150-Pro2 does not utilize an artificial reactive circuit or speaker emulation circuit. After all, what could be more natural than using your speaker's unaltered reactance to develop the tone from your tube amplifier? Also, the PRX150-Pro2 does not utilize any EQ circuit. The SRT technology attenuates the amplified signal in a very linear fashion across the entire frequency spectrum. The PRX150-Pro2 is also a wideband device, allowing the full audio spectrum produced by the tube amplifier to pass through it. The tone you hear is not altered or "tweaked" by an internal EQ. What you hear is purely the tone generated by your tube amplifier, passing through the attenuator, to the non-loaded speaker. The tone you hear will be very natural sounding with the dynamics preserved. You will notice that the full bandwidth of the signal is maintained, with bottom end, mids and highs fully intact. The SRT technology also allows for a smooth transition from the Step Attenuation mode to the Continuous Variable Attenuation mode. The tone and dynamics remains consistent throughout the entire attenuation range. You do not get the dulling effect or detect any unpleasantness in the tone, when switching from one step to another or from the step mode to the variable mode, as you do with most other attenuators. Also, the PRX150-Pro2 does not utilize an inexpensive variable L-Pad for the variable attenuation mode as some of our competitors do. Our Variable Mode allows for very fine adjustment of the "bedroom" volume level, across the entire rotation of the Variable Attenuation knob. Unlike those attenuators using an L-Pad, which provides a course adjustment at "bedroom" volume levels, making small incremental changes in volume more difficult. The Continuously Variable control covers two ranges of attenuation, via the front panel toggle switch. Guitarists will also find the PRX150-Pro2 very useful in getting more power tube involvement in their cleaner tones, which can add depth to their slightly broken up cleans and a greater purity to their lightly overdriven tones, while still maintaining the desired volume. Therefore, blues and jazz guitarist will also find the PRX150-Pro2 a very useful tool. The PRX150-Pro2 is engineered to take the power and the heat. With its continuous 150 watt power rating, the PRX150-Pro2 is designed to handle the brute power of most fully cranked 100 watt "quad" tube amplifiers, whose output power are often well over 100 watts. Exclusive to the PRX150-Pro2, are the individual input and output impedance selector switches. The user can set the attenuator's input impedance to match the amplifier's impedance and separately set the attenuator's output impedance match the speaker's impedance. This allows proper matching of mis-matched amplifier to speaker impedances. For example; suppose you have an amplifier with a fixed 4 ohm impedance and you want the attenuated power to drive a 16 ohm speaker cabinet. With other attenuators this is typically not an option, however the PRX150-Pro2 is specifically designed for this purpose. You simply set the attenuator's input impedance to 4 ohm and separately set the output impedance to 16 ohm. The SRT technology allows dissimilar impedances to be properly matched, providing the correct load impedance to the tube amplifier. Unlike other attenuators that force you to match the input and output impedances, the PRX150-Pro2 has the ability to "mix" and "match" the amplifier and speaker impedances. This allows 16 possible Input and Output impedance combinations, while other attenuator products offers only a single or at the most 3 impedance combinations. With the PRX150-Pro2, as you add or change amplifiers and speaker cabinets to your collection, you no longer have worry about buying another attenuator to match the impedance of your new gear. Therefore, the PRX150-Pro2 will be compatible with your entire current and future collection of tube amplifiers and speaker cabinets. The PRX150-Pro2 also features a Load Mode and Line Out with Level Control. The Line Out Signal is equalized to emulate the natural high frequency roll off of a guitar speaker. The Line Out allows you to send the amplifier's signal to sound system, recording system, rack mount effects, slave into another guitar amplifier or an external power amplifier (Wet/Dry Configuration). In the Load Mode the Line Out can be used with or without the guitar speaker attached. The Line Out feature is always active, therefore the Line Out can be used even when the attenuator is in the Bypass mode. This can be useful when you require the Line Out feature, but do not require any attenuation. Available separately is a Line Out 1/4" to XLR Line Matching (Impedance) Converter. For more details see the Pricing/Accessory section on this page (below). The BYPASS-ATTENUATE Switch allows the user to bypass the attenuator without having to disconnect the speaker cables. The Line Out Feature is "always on", allowing the Line Out to be used, even when the attenuator is in the Bypass mode. when position "F" is selected, for a total of 16dB of attenuation within the step mode. 16dB cut in power translates into the speaker receiving less than 3% of the amplifier's power. * Uniquely allows dissimilar amplifier and speaker impedances to be used. * Each PRX150-Pro2 attenuator is constructed and tested "in house" at ARACOM Amplifiers. No deposit required to join the PRX150-Pro2 wait list. We just ask that you be sincere about purchasing the product, when your PRX150-Pro2 is ready to ship. * A 15% restocking fee applies to return goods, contact ARACOM Amplfiers for more details. With the Rack Mount Option, the standard PRX150-Pro2 housing is attached to a 19" wide shelf. The heavy duty rubber feet provide protection against shock and vibration. The rack mounted PRX150-Pro2 requires 5U (rack units) of vertical rack space. Contact us for pricing information. A padded "Tuki" brand, Cordura Nylon Gig Bag is available for the PRX150-Pro2. If you are going to be taking your PRX150-Pro2 to gigs, then we highly recommend the Tuki padded Nylon Gig Bag for added protection. The PRX150-Pro2 comes with a limited 1 year warranty. Clip #1: Gibson SG, 1979 Marshall 2203 amplifier, PRX150-Pro2 attenuator (bedroom mode), Marshall 1960TV 4x12 cabimet loaded with four 1978 Celestion G12-65 speakers. Clip #2 (You Shook Me All Night Long, AC/DC): Gibson SG, Ceriatone 50w plexi amplifier, PRX150-Pro2 attenuator (bedroom mode), Marshall cab from 1976 with blackback G12m25'sspeakers. YouTube find: Nik Huber Dolphin guitar, cranked up vintage Marshall amp, PRX150-Pro2 (heavy attenuation), 4x12 cab. Thanks to Spiraless, a jazz-fusion instrumental rock band from Bulgaria. YouTube find: James Trussart Steelcaster guitar, cranked up vintage Marshall amp, PRX150-Pro2 (heavy attenuation), 4x12 cab. Thanks to Thanks to Spiraless, a jazz-fusion instrumental rock band from Bulgaria. * California Residents add 8.25% sales tax. Power Rox PRX150-Pro2 is a trademark of ARACOM Amplifiers.